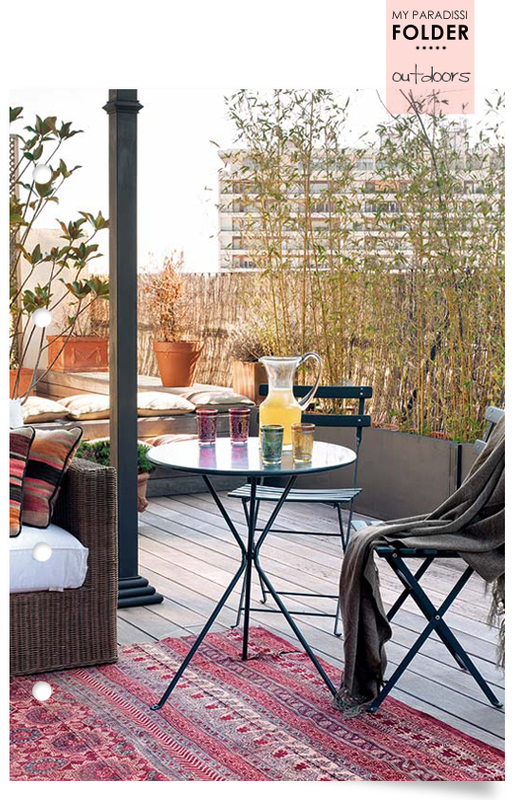 Here's a terrace that captured my heart pronto! It is the ideal size for actually living outside during the warm summer months and perfectly protected with all the tall plantation that's hiding the view of the city buildings. I love outdoor spaces that are treated with a cozy, indoors approach. Like this one, with the amazing deck floor and the warm colored kilim, the nook created with the wicker sofa and the contradicting metallic chairs and table. Wouldn't mind having that lemonade right now, care to join me? P.s. You can treat your outdoor space with decking materials for a similar result! 1 comment on "Folder: Outdoors"
I so love the place. So relaxing and absolutely perfect to spend a good summer with.